Titus 2:6-8 Similarly, encourage the young men to be self-controlled. In everything set them an example by doing what is good. In your teaching show integrity, seriousness and soundness of speech that cannot be condemned, so that those who oppose you may be ashamed because they have nothing bad to say about us. The Apostle Paul writes to Titus to encourage him, having left him behind to ensure the “perfecting of the saints”. 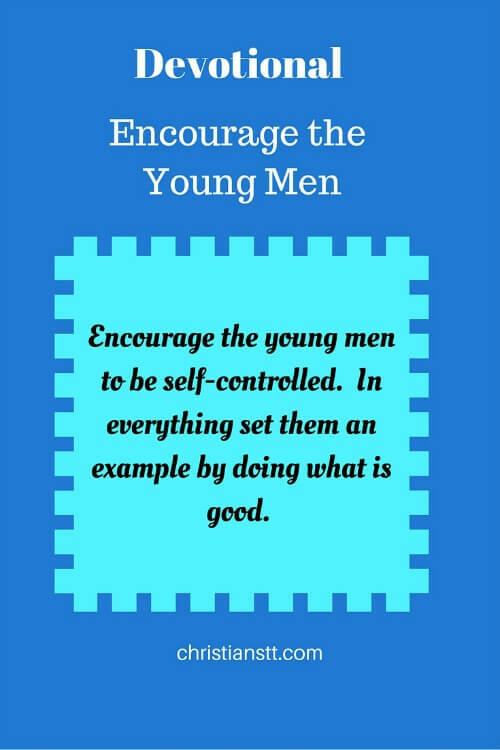 The young men are to be encouraged to be self-controlled. Titus is to be an example by doing what is good. Young men today are crying out for role models. Instead of following the good examples in the body of Christ, they look up to movie stars and rap singers who lead a life of drugs and violence. They dress in the styles of prison inmates, and speak as gangsters. As we motivate our young men and women to do the things of Christ, let the men (and women) of the church be fitting examples that you would not be held accountable for their deviations from the Word. Men: stand up and be counted, teach your sons and daughters, by first doing what is good. Show integrity (seriously lacking in society today) and soundness of speech. When you speak to your children, they must be able to trust you at your Word. Don’t be a liar to your children and your wife. Respect your parents so that your children will learn to respect you (not fear you). May The Lord grant you grace, mercy and peace on this wonderful day. Be blessed!